Nourishing Breakfasts on the GO Ebook! I can’t even begin to tell you how delicious these balls are! I created these as I was speaking at an event and taking some delicious snacks to enjoy with the attendees after… I of course taste test EVERYTHING: D and they were that good I made a second batch to eat !! They taste even yummier than banana bread?! Is that even possible?? They will keep you full, and the best snack to have on hand when those morning and afternoon hunger strikes. I created them using Whole-grain Oats, which are a great source of soluble fibre and healthy carbohydrates, keeping that blood sugar stable! Which is exactly what you want if you are trying to lose/balance weight. They are LOW FODMAP so NO dates!! woop woop for all my fellow sufferers. If you prefer dates opt out the Rice Malt Syrup and throw in your dates. They are damn right Wholesome and delicious. Plus extra bonus, they are so damn simple to whip up! Literally 10mins. Subscribe to The Wholesome Heart! Keep up to date with all things wholesome, Wellness tips and incredibly easy, nutritious Recipes!! Share The Wholesome Heart Vibe! Place oats into a food processor, blitz until flour consistency. Add all other ingredients, except for the chocolate chips. Blend until dough consistency forms. Stir through chocolate chips and place in fridge for 10 minutes. This helps the dough harden making it easier to roll into balls and set. 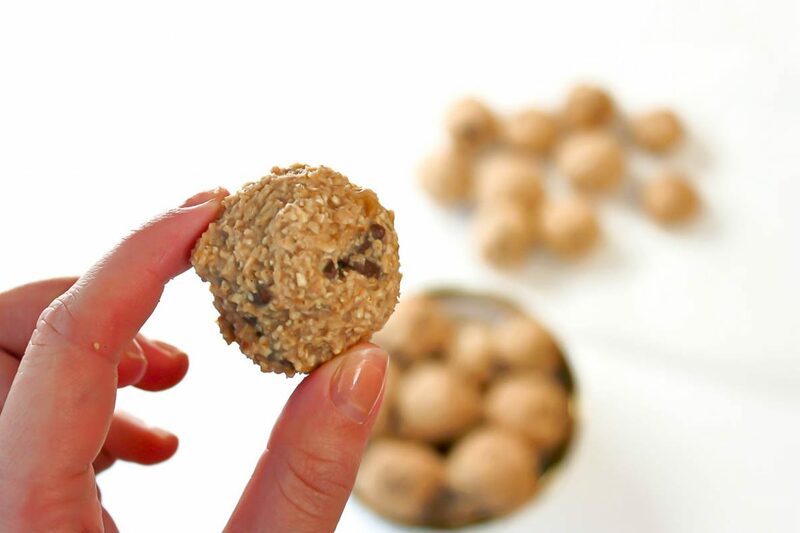 Remove from fridge and roll into 1 tablespoon balls. You can keep these in the fridge for up to one week or longer in the freezer. Healthy Fats & Dangerous Fats – how to decipher! Vegan Peanut Ramen Soup – 25 mins! How Do I Know if I Have a Leaky Gut? Copyright © 2017 The Wholesome Heart, All rights reserved.